You’re probably familiar with the most common way to write music, with notes on a staff, even if you can’t read music yourself. But did you know there are other ways to do it? One of them, the Korean system Jeongganbo, dates all the way back to the Joseon Dynasty, which began in 1392 and ended much later, in 1910. Rather than using a staff system, it uses a grid system, with each note taking up a square in sequential order. Seoul-based artist Suki Seokyeong Kang was drawn to this geometric composition technique, and has created a series of “visual translations” of Jeonggabo in her new solo show at Chelsea’s Tina Kim Gallery. 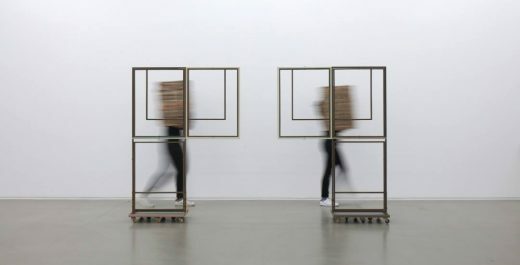 The show is mostly sculpture based, in a way that attempts to put forth both logic and harmony. Perhaps after exploring, you’ll come away with a subconscious new knowledge of how music can be made. Opening Thursday, March 1 at Sargent’s Daughters, 6pm to 8 pm. On view through March 4. How do you typically eat fruit? Whole, chopped, sliced, diced, peeled, blended, with chocolate, in yogurt? 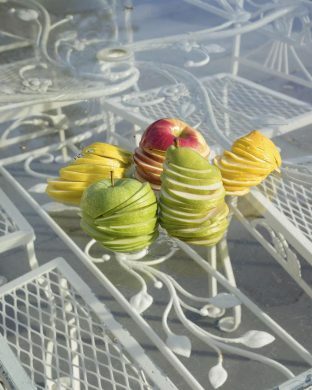 I am asking because the lead image for Jackson Hallberg’s pop-up exhibition, presented by Duplex and appearing in the downstairs space at Sargent’s Daughters, is a photograph of various colorful fruits sliced very thin but still holding their shape, at least in a weird slicey way. Not only that, but the show deems itself “an elegy to the vacuum of consumption” that we all personally experience, so it seems at least vaguely relevant to see this fruit and subsequently wonder about your own preferences. You probably take photos of fruit, too, don’t you? Opening Saturday, March 3 at Spoke Art NYC, 6 pm to 8 pm. On view through March 25. As New York City is a hub for art, it naturally attracts scores of artists from all over the world, eager to show their work to collectors and civilians alike. But Spoke Art’s latest show, curated by Jennifer Rizzo, is all about the artists that live right here. Mixing “lowbrow” and “highbrow” styles of artmaking (but with a focus on the more lowbrow, whatever that might mean to you), Meet Me At Delancey / Essex allows local artists to engage with the city itself or imagine entirely new ways of city living by way of architectural sculptures and other creations. 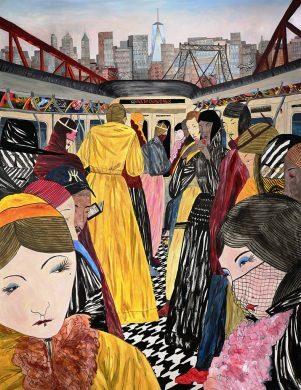 And honestly, looking at a painting of a really crowded J train going over the Williamsburg bridge is a lot better than actually being on one. Though I recently was on a J train that was entirely empty from Flushing to Essex, and I assumed my life would casually become a horror film at any moment. Opening Saturday, March 3 at Knockdown Center, 6 pm to 9 pm. On view through April 15. 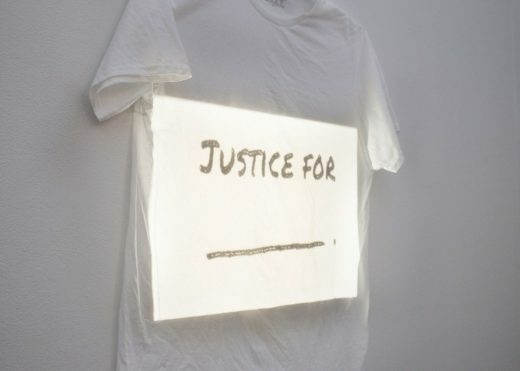 One of the pieces on view at Knockdown Center’s new group show is an image by Lachell Workman of a plain white T-shirt with a square of bright white light projected onto the front. In thick black writing, it reads “Justice for _____.” Because we know justice will always be needed for someone or something or somewhere that’s probably not getting it now and maybe never will get it adequately, the work serves as something that’s likely to be eerily, eternally relevant. “Material witness” refers to someone who has information that is useful to a criminal trial. This focus on the individual is no coincidence, as the show specifically delves into the effect trauma, systemic violence, and resistance have on the body, particularly one that lives in a society where injustice can often be caused by the very institutions that are supposed to protect. Saturday’s opening reception will also feature performances at 7 pm by Morgan Bassichis, Glory Day Loflin, and Amber Atiya.